The only thing that Riek Machar is fighting for is to become president of South Sudan. AFRICANGLOBE – South Sudan’s rebel leader Riek Machar has been sworn in as vice-president in a boost for a peace deal aimed at ending more than two years of conflict. Tens of thousands have been killed and about two million people left homeless in the conflict in South Sudan, which became independent in 2011. Machar fled Juba at the start of the civil war in December 2013. “I am very committed to implement this agreement so that the process of national reconciliation and healing is started as soon as possible,” Machar told journalists at the presidential palace in Juba. 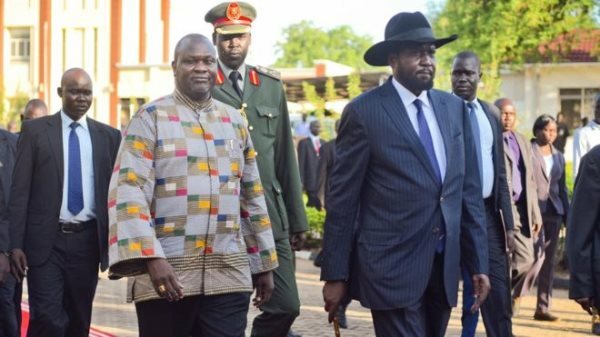 Meanwhile, President Salva Kiir welcomed Machar back to South Sudan, twice referring to him as his “brother”, according to a transcript of his speech published by the local Radio Tamazuj news website. Earlier Machar, wearing a light-coloured shirt, was greeted by ministers and diplomats as he stepped out of his plane. The US Ambassador to the UN and backer of Machar, Samantha Power, described Machar’s return as “the best hope that South Sudan has had in a very long time”, but warned of the need to keep up the pressure on both sides to make sure the peace deal was properly implemented. The civil war broke out over tensions between Mr Kiir and Machar, who was sacked as vice-president in July 2013.